Hey, hey, hey, it's PUBLICATION DAY. 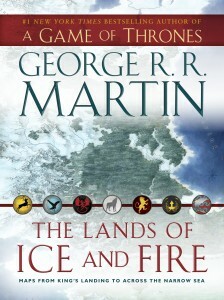 My latest Ice & Fire book should be in the bookstores today. It's not the usual sort of book, admittedly... not an actual book at all, but a book-shaped box containing a whole bunch of gorgeous, glossy, fold-out maps of Westeros, Essos, and the lands and seas from A Song of Ice and Fire. It's from Bantam, and it's called THE LANDS OF ICE & FIRE. This one is for the map geeks, I admit. Of which there seem to be a goodly number. I've had maps in all the novels, of course, but from the very first I've been getting emails from readers who wanted more maps, with more detail... and more... and more. What's beyond that? What's below that? What's past that range of hills? Some... many... wanted a world map. Which I was reluctant to do. I like my readers to see my world as my characters see it. And the truth is, medieval maps were not very good, by modern standards. A map drawn by an Englishman in 1300 might be fairly accurate for England and maybe France, but distortions and errors would start creeping in when you got to Italy and Germany, the Russias and the Holy Land would be more distorted still, Africa was largely unknown below the Sahara (even the coasts), and further east you started getting "the realm of Prester John" and "land of the two-headed men" and "here there be dragons." Which I said, more or less, in numerous interviews, and which did nothing to curb the demand for maps, maps, maps... especially that world map. I try to oblige. 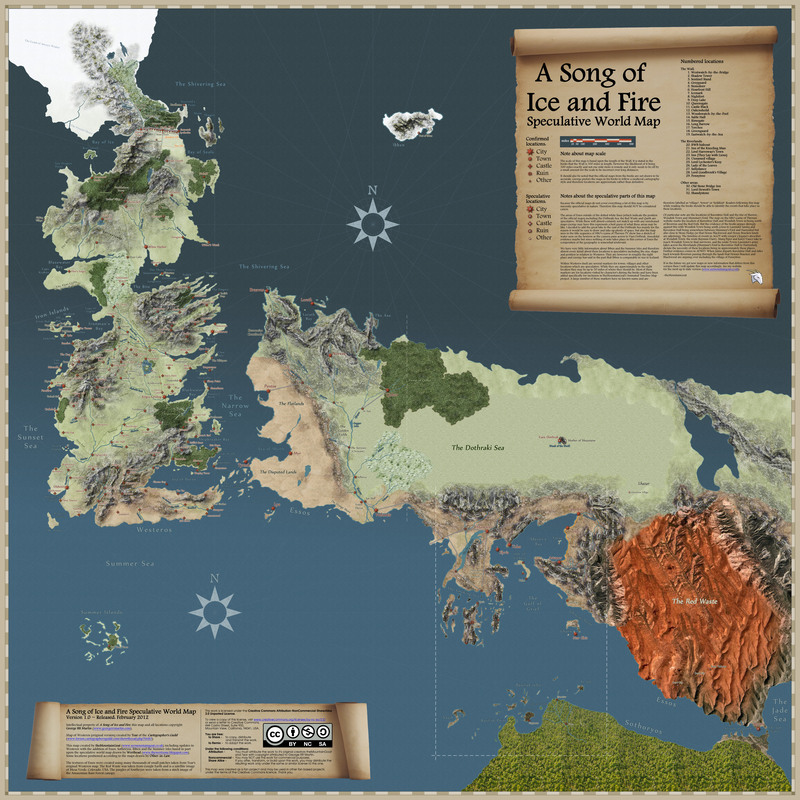 You will find a map of the "known world" in THE LANDS OF ICE AND FIRE... one that includes lands and seas you have never seen on any of my maps before... the plains and mountains east of Vaes Dothrak and Qarth for a start. (Remember that tapestry Xaro Xhoan Daxos gives Dany in DANCE OF THE DRAGONS?) Even so, it's not a COMPLETE world map, no. The idea was to do something representing the lands and seas of which, say, a maester of the Citadel might be aware... and while the maesters know more about Asshai and the lands beyond than a medieval monk knew about Cathay, distance remains a factor, and past a certain point legends and myths will creep here. Here there be winged men, and such. These are very nice maps, I hope you will agree. Huge and beautiful, and while they DON'T show the whole world (sorry, no, you're not going to get the Westerosi equivilent of the Americas or Antarctica or Australia, assuming such places exist), you will get a glimpse of distant lands where my characters (and thus the novels) will likely never go. Of course, all of the more familiar lands and places are covered too. Westeros north and south, the Free Cities, Slaver's Bay, the narrow sea... we've included some great city maps for both King's Landing and Braavos. Got to admit, I am kind of a map geek myself. This one was more work than I anticipated, but I had a lot of fun doing it, and I hope you'll enjoy it as well. Go order your copy from Amazon or your favorite online bookstore, or pick one up at the local brick 'n mortar, and know the lands of ice and fire as you never have before. 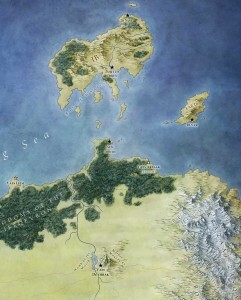 Wasn't Qarth located at the straits between Essos and Sothoryos? On the second map, I'm seeing an island called Great Moraq opposite the Jade Gates. There's an earlier map produced by HBO showing Qarth on the straits between Essos and what was either eastern Sothoryos or another part of Essos. It was on their website during the airing of Season 2 (actually, I think it's still there). However, my understanding is that this map was based on very early drafts. When the LANDS OF ICE AND FIRE project was proposed, George decided to completely revamp pretty much everything east of Slaver's Bay so it looked better. 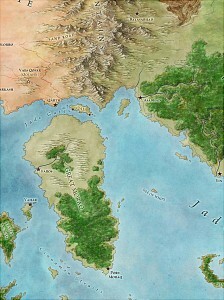 Another major change was that the Jade Sea was originally east of the Dothraki Sea and that massive mountain range, whilst now there are more plains and lakes that way, with the Jade Sea now located south of Essos. Interesting. Okay, so is this map closer to the current version or more far off? 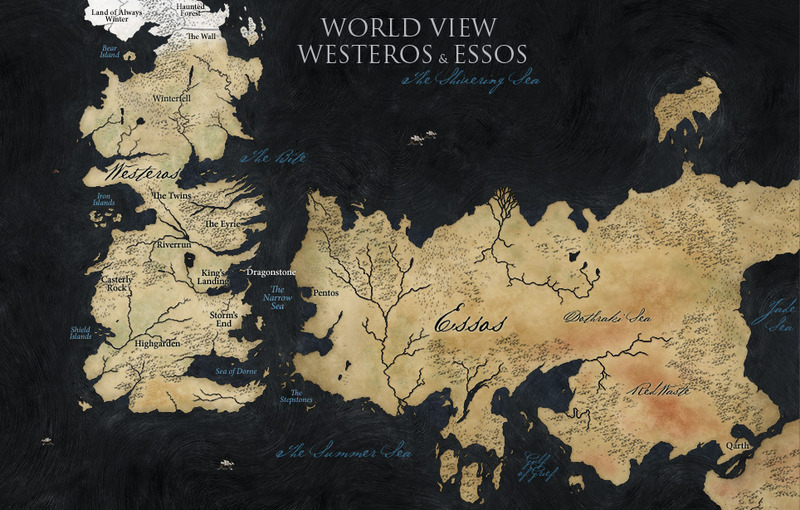 Essos is pretty far off, especially as one moves further east. Yeah, that's Ser Mountain Goat's great-but-speculative map from a year or so ago, before Season 2 of the TV show aired. In short, it's quite different. So it's possible to sail from Ghiz to Asshai without necessarily going through Qarth? Simply bypassing the Great Moraq from the south? Then Qarth isn't really located on such a key position, since it could easily be bypassed. True, but Ran at Westeros.org raised a great point that the currents in the Jade Sea could be clockwise and the 'traders circle' around the sea could be reliant on this. So going via Qarth would be much faster and more efficient than going through the Cinnamon Straits south of Moraq (you go through them on your way back from the Jade Sea, Qarth on the way there). 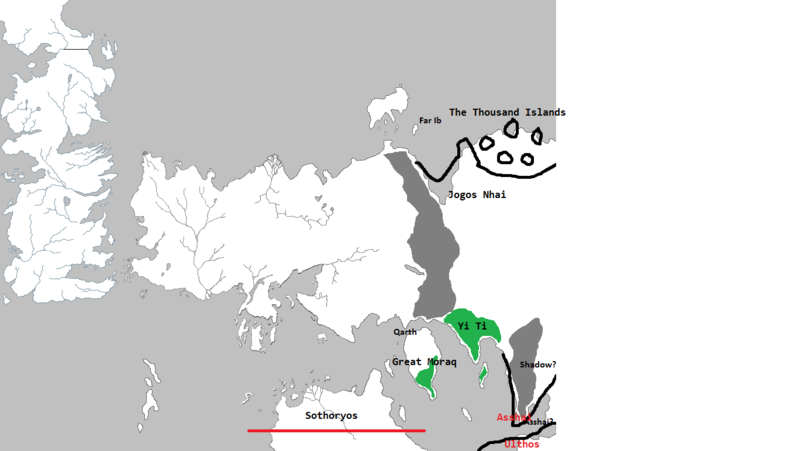 Asshai is not nearly important to trade as Yi Ti, and the rich port cities of Yi Ti (and Leng) and more easily reached via Qarth. Interesting! So is Leng part of the nation of Yi Ti?